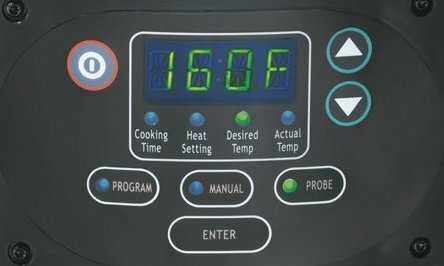 What is the difference between “high” and “low” temperature settings on a slow cooker? Actually, there is no difference in the actual cooking temperatures between settings for the original crock pot and most other slow cookers. The difference between slow cooker settings is about time and not temperature, which is about twice as long. Both “High” and “Low” stabilize at the same temperature; it is just a matter of how long it takes to reach the simmer point. Recipes that take less than seven hours to cook on low are not recommended to be converted to cooking on the high setting, whereas ones that require more than seven hours on low can be cooked for shorter times on high. Here’s a cooking time conversion chart. Anyone who tuned into “This is Us” on Sunday might be at least somewhat interested in checking out the safety of their slow cooker. First and foremost, only plug in a slow cooker when you’re ready to turn it on and always unplug a slow cooker (and most any other appliance that isn’t used all day) after use. I guess we all at least learned that (and to replace our smoke detector batteries) from the show, but there also exists the possible worry for the safety of the food being cooked. The other concern that does exist with slow cookers, as with any appliance, is that it could become defective and not perform the job as it should. The biggest concern is the safety of the food within, which must be kept above the “danger zone” temperature in order to prevent the spread of bacteria, especially if the contents contain ingredients such as meat. The food “danger zone” is temperatures between 40°F and 140°F. Bacteria grows quickly within this temperature range, which is why refrigerators must remain below 40°F and cookers must remain above 140°F. If you have an old slow cooker, it might be a good idea to test if it is actually working properly by following these steps. Fill the slow cooker halfway to the top with water and then place the cover on. Turn the slow cooker on “Low” and leave it for 8 hours. Remove the lid and immediately place a food thermometer into the water – careful the water is hot! The thermometer should read 185°F. You might think this is too low of a reading, but remember that a covered pot loses about 10 – 15° of heat whenever the lid is removed. If the water temperature reads a higher number, that’s OK, but you may need to reduce cooking times provided in your recipes or the bottom ingredients will become too dark without any stirring. If the water temperature reads less than 185°F, that is NOT OK, you should see about replacing your slow cooker with a newer model – perhaps one with an auto shut off feature. NOTE: If you have a slow cooker with a temperature probe, as in the above picture, the temperature displayed is for internal temperature of the roast and not the cooking temperature. For slow cooker tips that work for any brand of slow cooker or crock pot, see our slow cooker tips. To check out the slow cooker that we use, see our recommended slow cooker. For some great slow cooker breakfast recipes, see our slow cooker breakfast post.